Last weekend, I hung out in some faraway burbs after going to a little art reception in the middle of nowhere. I was in bryn athyn, which has a crazy story. As in entire town of inbred swedes. Seriously. In any case, we grabbed some vittles after nearby. 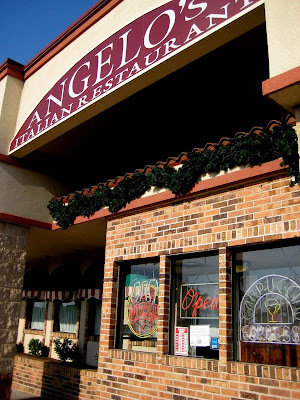 Angelo’s is an italian joint in some random suburban stripmall. I wasn’t sure if it was open because there were no cars around. But it was early, so I guess that made sense. The place is very old school on the inside. Not swanky. It’s very laid back here. So yeah, it’s italian food. Standard stuff. Me? 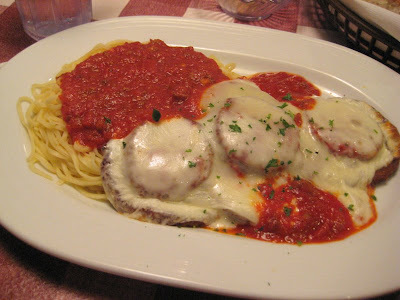 I got eggplant parm. 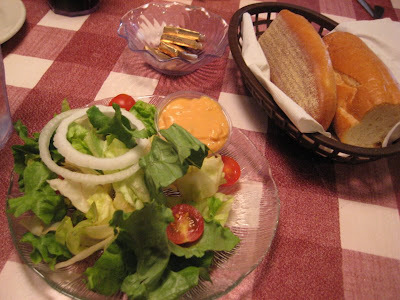 You get a salad too, and some bread. This salad was kind of sad, but you know it’s just something accompanying the main event. My eggplant parm was great. Just old fashioned and hearty. 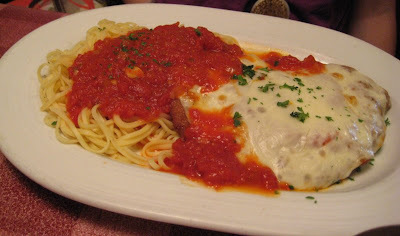 R got the veal parm. A very sizeable hunk of veal. And we both got giant heaps of pasta with it. The spaghetti wasn’t round, it was square or rectangular, which made us think that it may have been homemade, but that’s just a guess. This place might not be that fancy. The service was not that hot. Getting the server to run our check took forever. We kept wanting to pay and give them our money, but it’s like they weren’t having any of it. And they never offered us any refills on drinks. Not soda and not water either. Service is definitely not the high point here. That is the food. It’s a nice neighborhood joint for a hearty affordable meal.